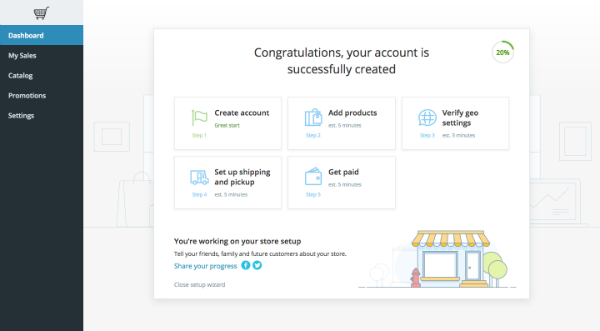 Once you have signed up for the Online Store, the Online Store Wizard will take you through the steps to get started selling online. 1. Click Add Products to start building your product catalog. 3. To add additional products, click Add more. Once you're done uploading your products, click Save. Tip! You can edit the product’s category, options, images, tax, and shipping information at a later stage. For more ways to add products to your catalog using More powerful options, please visit our Online Store tutorials. 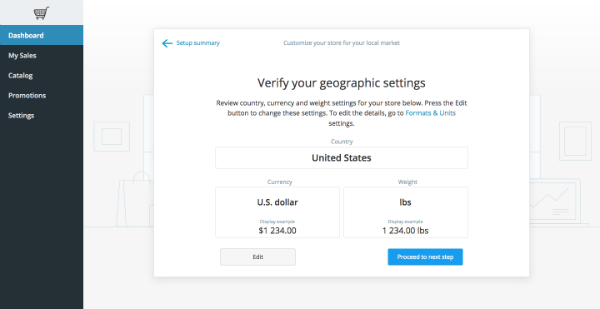 This step allows you to set up your country, currency, and preferred metric system. 1. Click Verifying your geo settings. 2. If the country and currency displayed are already correct, you can click Proceed to the next step. 3. If not, click Edit to update the settings. 4. You will be taken to a page to set up the country, currency, and/or weight. Now that you've established your location and currency, you can set up your shipping. The Online Store supports shipping options worldwide and also gives you the flexibility to choose your shipping provider. 1. Click Setup shipping and pickup. 2. You can determine if you require shipping or not. For this tutorial, we will say that you do want to set up shipping. Click Set up shipping. If the one you want is not listed, you can click on the advanced shipping options link. 4. We're going to select set custom flat rates. 5. 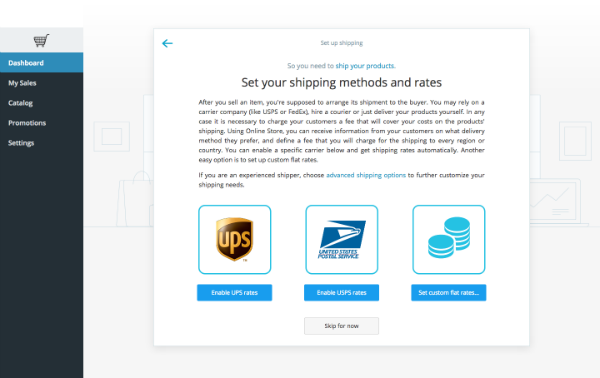 To set up a flat rate shipping fee based on The World, enter the rate and click the Proceed to next step button. Should you require more options and flexibility, you can click the Advanced shipping options link. Click +Adding Shipping Method. Carrier­ calculated: Automatically calculate costs based on carrier rate tables. Flat rate: Set a flat shipping rate, or specify free shipping. Custom table: Customize your shipping costs by weight, number of items, or cart total. For a detailed explanation of the difference between the methods, and how to set them up, please see our tutorial Online Store: Set up your shipping. Shipping costs are generally calculated on weight and distance. To ensure you receive the correct carrier­ estimated cost of delivery for tangible products, you must configure your product weight correctly. You're nearly done! The last big step you need to complete is how you wish to accept payments from your customers. 1. Click the Get Paid button. The Online Store supports many other payment gateways as well. To access these alternative payment options, you can click Advanced payments setup. 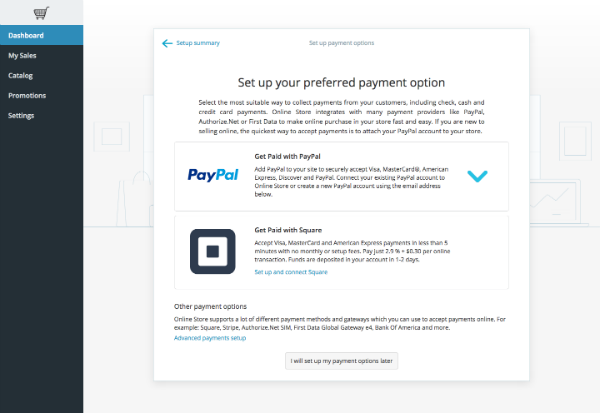 If you are not ready to select your payment options, you can skip this step by clicking I will set up my payment options later. Congratulations on setting up your store! If you're looking for more tutorials, please visit our Online Store tutorials.